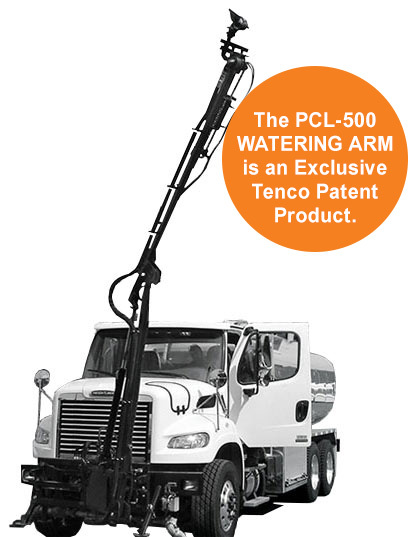 Benefit from Tenco’s expertise as North America’s only manufacturer of watering arms. • Add a reliable piece of equipment to your tanker truck. • The PCL-500 arm is the safest and most reliable equipment on the market. • Flexibility allows the arm to move around obstacles such as park benches, garbage cans, etc. • The powerful PCL-500 allows cleaning the streets with the water flow controlled by the directional nozzle. • Can be used for spraying chemicals on trees, flowers, and lawns. • Other possible uses with the PCL-500 iswatering winter exterior skating rinks. Thanks to its extendable arm and directional nozzle that can bypass obstacles, the PCL-500 offers a clean, safe, and efficient way to hose down sidewalks and water flowers in hanging baskets on lamp posts.